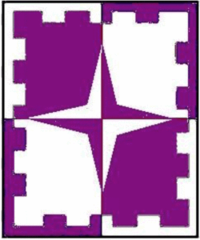 Quarterly purpure and argent, a mullet of four points and a bordure embattled counterchanged. 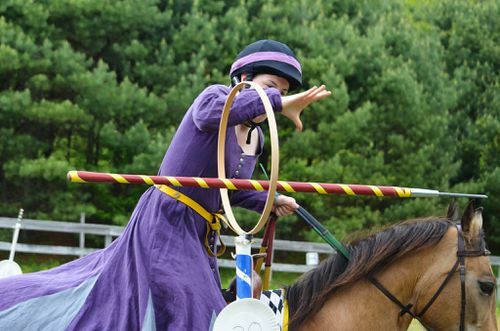 Baroness Alanna is an accomplished equestrian and a member of Equus Celox. She is also the protege of Mistress Eleanor fitzPatrick. 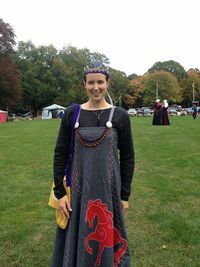 Her interests include making garb, embroidery, thrown weapons, archery, helping where needed and learning new things. She is currently the keeper of Carolingian Gold Key, the loaner garb that people can borrow from the barony, and hosts newcomer night. Alanna prefers not to be surprised but won't be mad if you can't warn her before. Contact Isabelle de Montreuil sur Mer or Elian of the Fellswood if needed. This page was last edited on 18 March 2019, at 20:53.